This is definitely an "accent specimen," a conifer useful in a full-sun or lightly shaded area where you want to make a statement. 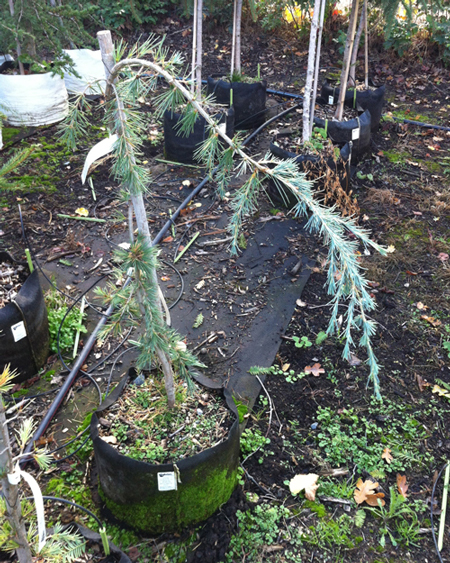 The Blue Weeping Cedar of Lebanon has pendulous, irregular-growing branches clothed in powdery bluish-green needle clumps. Train it upright to develop a leader, then let it spill over and flow - along a fencetop, over a boulder- to excellent effect. Ours have been trained up several feet already, but you can take them up to 10-15ft, and they'll wander as much as 10' off horizontally. This conifer grows 1 to 1.5ft per year, giving you plenty of time to guide and direct it. If you don't train it, it may take off in any direction. It requires regular watering.